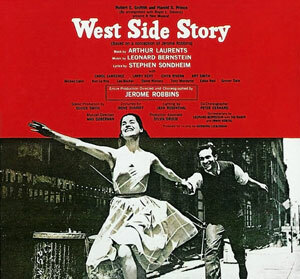 Stephen Sondheim appeared on ABC’s ‘Nightline’ on Tuesday night, and during the interview, the theater legend disclosed that he found the words to his 1957 masterpiece ‘West Side Story’, written with Arthur Laurents and Leonard Bernstein — are you ready for this? — “embarrassing.” What? There is one bad song in particular that stands out for Sondheim, one that Jack Nicholson turned into a hilarious parody in the film, ‘Anger Management,’ as many others have done. Longtime fans of Sondheim, who turned 80 this year, may have heard many of the anecdotes he mentions on the “Nightline” segment and in his new (and first) book, “Finishing the Hat.” But it’s still fun hearing insights from that modest guy behind such landmark musicals as “Sweeney Todd,” “A Little Night Music,” “Gypsy” and “Into the Woods.” Like the fact that he writes lying down. Or that he’d like to rewrite some of his classic songs. There’s even a Broadway theater named after him. Earlier this year, the Henry Miller Theater on West 43rd Street in New York City became the Stephen Sondheim Theater, another event in his career that the composer was somewhat uncomfortable with.